What prenatal diagnostic examinations are there worth recommending? Is there a risk and how high is it? Women are confronted with a myriad of questions during pregnancy. I am happy to advise you during a face-to-face meeting, give you solid answers to your questions and be at your disposal for the duration of your pregnancy. All modern prenatal diagnostic methods help to determine the status of the unborn child’s health as accurately as possible. The results are generally reassuring and the pregnancy can be enjoyed in a relaxed manner and the birth looked forward to with optimism. In the event of an abnormal finding, I ensure a precise diagnosis and discuss suitable treatment methods or options with you in detail. As a human geneticist, I can provide you with competent advice at an early stage with regards to the potential risk of passing on a disease as well as in the case of existing (genetic) disorders or abnormalities of your baby. Using highly developed laboratory methods, genes of the unborn child (fetal DNA), which are found in the mother’s blood, are examined for the three most common genetic disorders – trisomy 21, 18 and 13. For this purpose, a blood sample is taken from the mother to be sent for analysis at a special laboratory in Germany or America. The result is available after approximately 1 week, the detection rate is 99 percent. It is recommended to combine the taking of blood samples with an ultrasound scan. In the event of abnormalities or an increased nuchal fold of the baby, invasive diagnostics are preferable to the test. With this ultrasound examination, 60 to 70 percent of structural abnormalities can be detected or ruled out. The thickness of the nuchal fold also determines whether the child has an increased risk for Down syndrome or other chromosomal disorders or syndromes or if there is a heart defect. Solid answers to your questions. This test includes a comprehensive ultrasound scan of the fetus and a specific chemical analysis of the mother’s blood. The probability of a chromosomal abnormality is quickly and accurately determined from the combination of results. This result also acts as a decision-making tool for whether a placenta or amniotic fluid test is recommended. With the examination of fetal cells (of the child), which are sampled by means of puncturing the placenta or the amniotic fluid of the mother, chromosomal disorders of the child can be determined with 100% certainty. Given the relatively high risk of miscarriage (1:100), the two procedures are only used in the event that one or more results of another examination method (e.g. combined test or nuchal translucency scan) indicate an increased risk. As part of a detailed, complex ultrasound scan, the child is carefully examined from head to toe. Around 90 percent of all structural abnormalities of bones and organs are identified as a result. The often neglected examination of the heart during conventional ultrasounds is a particular concern of mine. Normally, the results are reassuring and the pregnancy can be enjoyed without worry. With this vaginal ultrasound scan of the inner cervix, any inclination towards premature birth can be determined. This scan serves to determine whether the child is doing alright and is well. The size and circumference of the head and abdomen are also measured. Furthermore, the blood flow of the placenta, umbilical cord as well as other blood vessels of the child are examined and the amount of amniotic fluid checked. 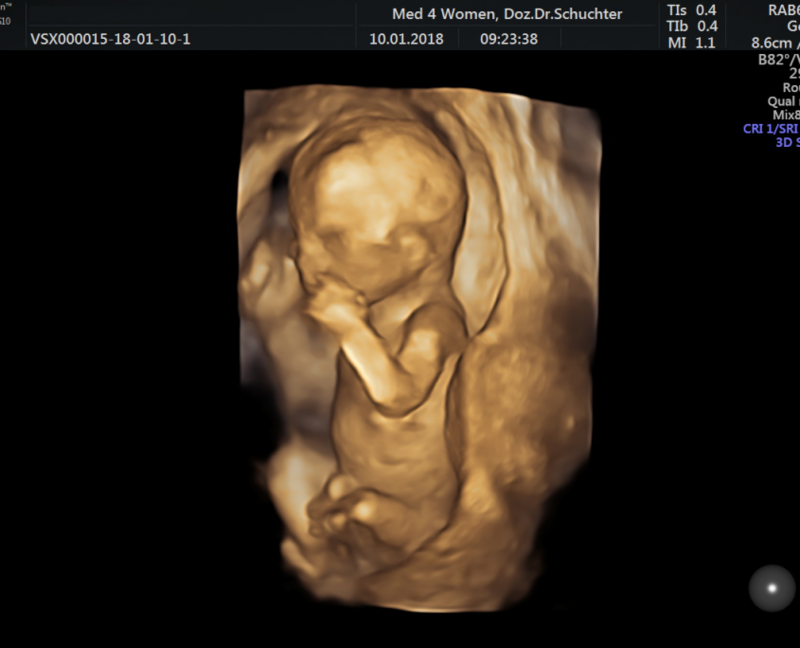 The three-dimensional ultrasound offers expectant parents the opportunity to get a ‘realistic’ picture of their child in the womb. The best gestational age for images is between the 12th and 16th week of pregnancy (for full body images of the baby) and between the 25th and 33rd week (for detailed images). 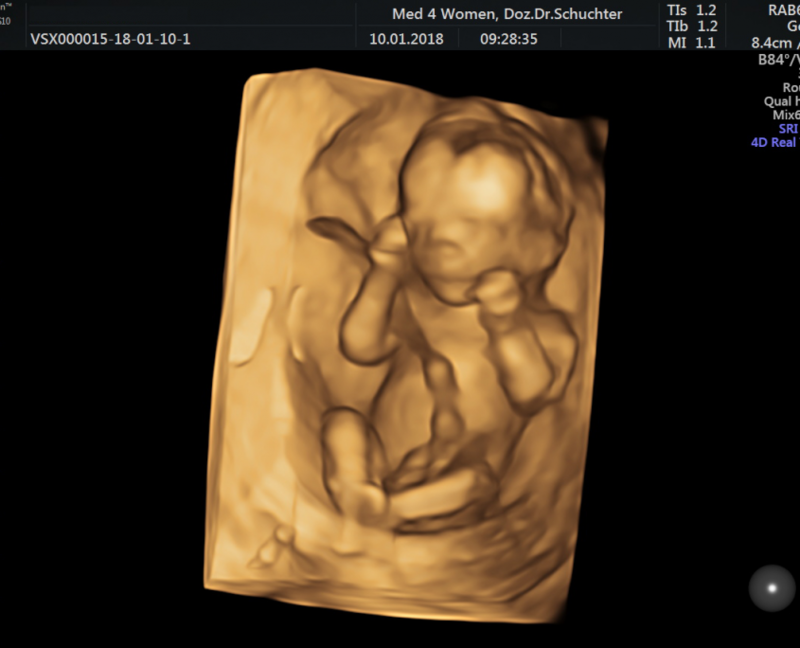 In principle, a 3D ultrasound functions in the same way as a ‘traditional’, normal ultrasound. 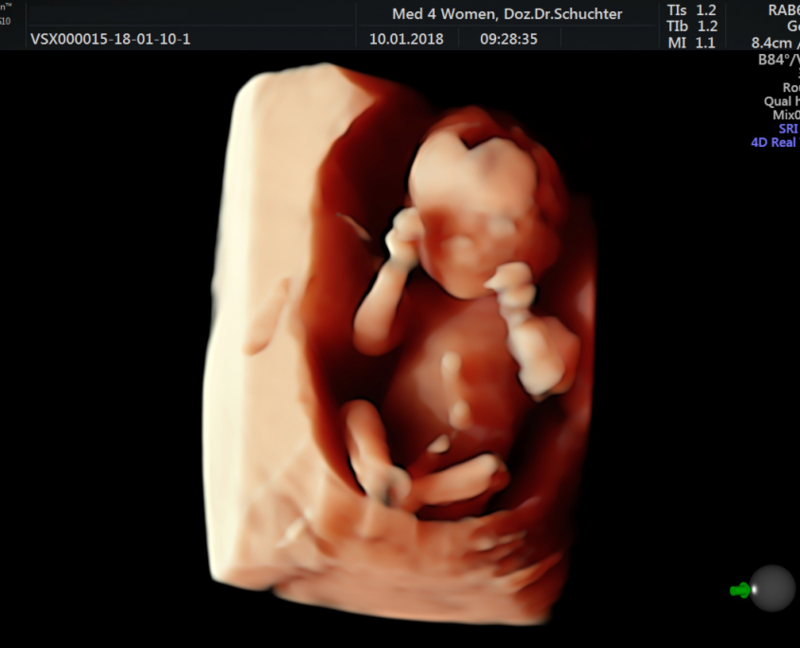 The difference is that not only one image but rather many different sectional images are created during the 3D ultrasound and then converted into a three-dimensional image by a computer – then you can see your baby up-close on the screen. These specific ultrasound examinations are carried out by my colleague Dr. Michaela Wurnig on Wednesdays at med4women in Taubstummengasse following arrangement by telephone on +43 (0)650 731 91 37 (michaela.wurnig@med4women.at). She has many years of experience in the field of 3D ultrasound and was also involved in the creation of the book “Ein Kind entsteht” by Lennart Nilsson (Mosaik publishing house, 2003). We burn all photos and video sequences taken during examinations onto a CD immediately afterwards or save them to a USB stick you have brought with you.